Brazilian torrent frogs live near running water, which makes communication difficult. So the amphibians have developed a broad repertoire of behaviours to tempt a mate and scare off rivals, according to Brazilian researchers at the Universidade Estadual Paulista, who just published their findings in PLOS One. The most common behaviours include loud mating calls in a variety of different tones, from peeps to squeals. Other behaviours are more rare. The frogs are brown, but the vocal sacs are pale white. The researchers think that not only do the males inflate their vocal sacs to make calls, but they inflate them when rival males appear, in a kind of “mine is bigger than yours” macho display. 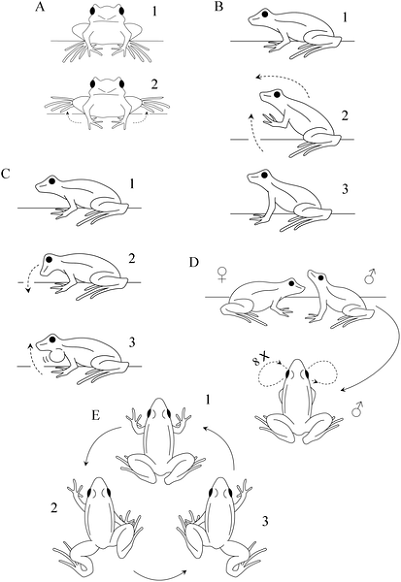 Brazilian torrent frogs also engage in fore-limb and hind-limb displays to catch the attention of a mate. You can see one such display in the video below at around the fifty-second mark. The male frogs will shuffle back and forth while perched on a rock to catch the attention of a female frog. They’ll bob their heads and nod before calls, or inflate one air sac but not the other. And in a failed effort to look casual, they’ll quietly raise one hand in a nonchalant wave. The various movements are captured in this learn-to-dance diagram that the researchers put together.